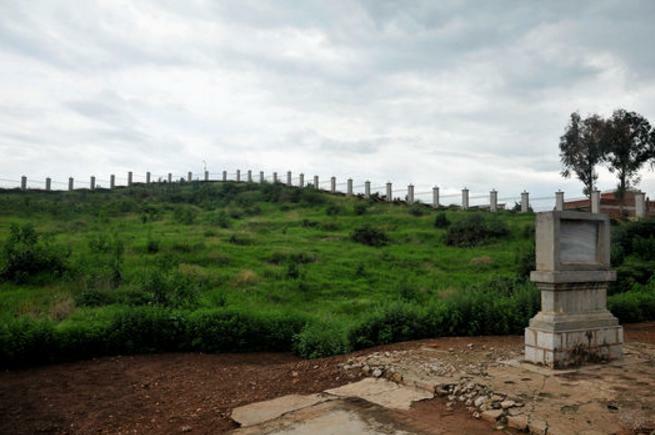 The Ancient Tombs on Shizhai Mountain is a national key cultural relics protection unit located in Jinning District, Kunming. It is the cemetery of the King of Dian Kingdom, the relatives and officials from the Warring States (475 BC - 221 BC) to the Western Han Dynasty (206 BC - 8 AD). It is the representative remains of the Shizhai Mountain culture. Shizhai Mountain is about 33 meters high, 500 meters long from north to south, and 200 meters wide from east to west. The graves of the Ancient Tombs on Shizhai Mountain are irregular. Generally speaking, the graves are between rocks on the mountain. The tombs are divided into 4 types. The first type is the tombs between the Warring States and the early Western Han Dynasty, the second and third types are the tombs in the middle of the Western Han Dynasty, and the fourth type is in the late Western Han Dynasty. Bronze wares, gold wares, silver wares, iron wares, jade, sea shell and so on were excavated in the tombs. The bronze wares were mostly cast by lost wax process, in which the processed of inlay, gliding, and engraving have reached a high level. Bronze wares include weapons, production tools, household appliances, storage vessels, musical instruments, and accessories. Weapons include dagger-axes, spears, battle-axes, swords, military forks, axe, crossbows, arrowhead, helmets, armors, etc. The production tools include hoes, shovels, sickles, chisels, needles, awls, fishhooks, etc. The living goods include pots, kettles, zun (a kind of wine vessel used in ancient times), pillows, mirrors, belt hooks, boxes, etc. The instruments include bronze drums, chimes, etc. Accessories were also found in the tombs. In addition, the bronze storage vessels are cast with various human activities, such as worshiping the ancestors, wars, spinning, farming and so on. In breathtaking shapes, these bronze wares are exquisite. The best time to visit Ancient Tombs on Shizhai Mountain is in the morning. There is no direct bus to the tombs from Kunming. The only option is to rent a vehicle. As at 22nd January 2019, the entrance pricing to the tombs is free of charge. Please don’t touch the cultural relics in the tomb. Please take enough drinking water with you. Interested in visiting the Ancient Tombs on Shizhai Mountain on a Tour? Wendy Wei Tours offers a variety of different packaged tours as well as custom tours including the Ancient Tombs on Shizhai Mountain, among other attractions and destinations. To find out more, please visit our Tours page or Contact Us directly to find out more.